ReActivate is a new PADI program that may not yet be available in all areas. If you can’t access ReActivate, or can’t access in your language your PADI Instructor can still complete a scuba skills review with you, and you can refresh your diving knowledge with Scuba Tune-Up Online. *Your PADI certification does not expire. Participation in PADI ReActivate™ is not mandatory, but recommended as an easy way to refresh your foundational scuba safety knowledge and skills if you haven’t been diving in a while. 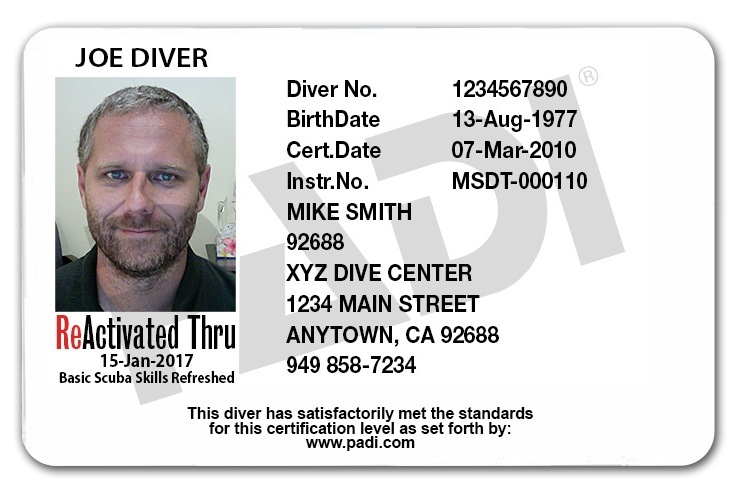 Divers who complete both the knowledge and in-water skill refresher receive a replacement certification card with a “ReActivated thru” date on it. Contact Serpent Aquatics to get ReActivate Touch or ReActivate Online and start working through the scenarios. Or, download the PADI App to your tablet or mobile device (if you haven’t already) and purchase ReActivate to get started immediately. Then, schedule your ReActivate water skills session. You’ll use basic scuba gear including a mask, snorkel, fins, regulator, BCD and a scuba tank. The exposure protection you need will depend on whether you dive in a pool, confined water or open water dive site. Serpent Aquatics staff will explain other equipment you may need to ReActivate.